Now you can wake up awesome all thanks to this Emmet LEGO Alarm Clock. The alarm clock looks like big LEGO pieces that are black and then on top of it you can see a LEGO figure of Emmet and he looks really happy to wake you in the morning. The alarm clock also has light in it so that you can see it in the dark and it does run on AAA batteries and they are included so that it is ready to go. 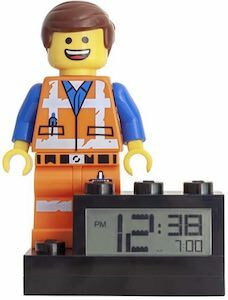 So if you like LEGO and Emmet from the LEGO movies then this alarm clock will be a great item to have on your nightstand. 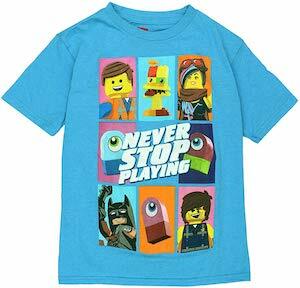 Now there is a fun The LEGO Movie Never Stop Playing T-Shirt that is made for kids. The light blue shirt shows a 9 squares and in 8 of them you will find characters from the movie and yes that does includes Emmet and even Batman. And then in the middle of the 8 squares it says “Never Stop Playing” and that counts for both kids and adults. You can get this LEGO Movie 2 t-shirt in kids sizes 4 – 12 and it is made from 50% cotton and 50% polyester. So any child that loves LEGO and the movies based on them can now be wearing an fun shirt like this. 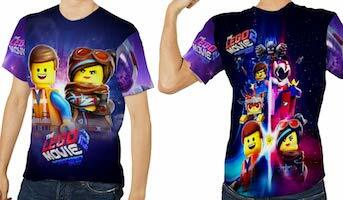 Now there is this amazing LEGO Movie 2 All Over T-Shirt. You can get this t-shirt in sizes Small – 3XL and it is unisex so that both men and women can enjoy it. On the front of the shirt you can see a big picture of Emmet and Lucy and the logo of the LEGO MOVIE 2 and then on the back you can find Lucy and Emmet again and a bunch of other characters. As this whole shirt is covered in the cool design everyone around you can enjoy lookign at it and it is great to wear yourself too if you like LEGO and movies. 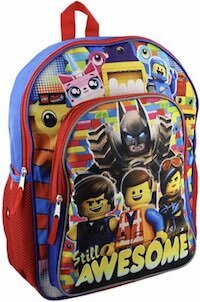 If you like LEGO and movies and you need a cool bag then you should check out this LEGO Movie Still Awesome Backpack. This LEGO Movie 2 backpack is just amazing looking as it is red and blue and on the front you can see many characters for the movie and yes that does include Emmet and Lucy but there are many more too. This LEGO backpack is 16 x 12 x 4 inches and has adjustable straps and mesh pockets on the side and a loop on top so that you can hang it where ever you want. With two pockets this backpack is easy to organize and is great for school, travel, and other adventures I even think it can hold your LEGO pieces. If you are so in love with spaceships just like the LEGO space guy then this is one pair of leggings you will need to get right away. 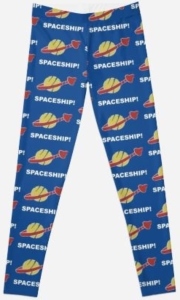 On these LEGO Movie leggings you will see the word ” Spaceship ” printed all over them along with the LEGO Space guy logo of a planet with a red arrow around it. This word and logo are printed all over the leggings front and back with a blue background. The LEGO Movie leggings are available in a wide selection of women’s sizes that will range from XXS to XL. They are slim fitting made from 88% Polyester and 12% Elastane to give you the perfect amount of stretch and comfort. Bring the classic LEGO Movie to life by looking like the main character the builder Emmet. 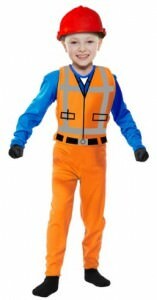 This kids costume features Emmet looking like his every day job of a construction worker, find a blue long sleeve under shirt with orange pants and an orange vest that has a printed on design and to top it all off a red helmet hard hat. The fun and cool Emmet costume is available in a wide variety of child sizes that range from 4 to 12 and included in this costume is the a hoodie and pants. This is perfect for Halloween, costume parties or just everyday dress up. Every good movie has a good cop and a bad cop, it is no different for the fun and awesome movie The LEGO Movie. 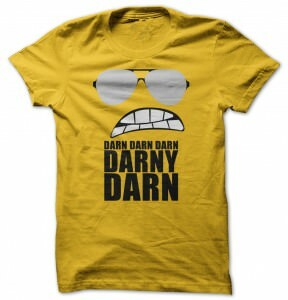 On this t-shirt find the face of Bad Cop, with the twist of his head he goes from good cop to bad cop and this t-shirt features the aviator style glasses and mean grin of bad cop on a yellow shirt along with the phrase “Darn Darn Darn Darny Darn”. Made to be comfy and durable the LEGO t-shirt is available in a wide selection of sizes that range from Small to 3XL and great for all occasions. Have a look at The LEGO Movie Bad Cop Face Darny T-Shirt. On the front of this t-shirt you will find Unikitty, she is one of the loveable characters in the super awesome movie The LEGO Movie. 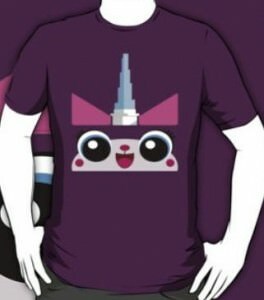 Unikitty is a LEGO minifigure and is a cross between a unicorn and a kitty cat, this t-shirt has a big face image of Unikitty with big cute eyes, friendly smile, ears and a unicorn horn. Made from 100% cotton to be super comfortable while also lasting a long time, it is available in a wide variety of sizes that range from S to 3XL and you can get the Unikitty face print on the front or back aswell as choosing from 18 different fun colors. Check out the rest of the shirt styles too from hoodies, organic cotton, women’s fitted and many more. Keep your happy thoughts and wear this The LEGO Movie Unikitty Face T-Shirt. 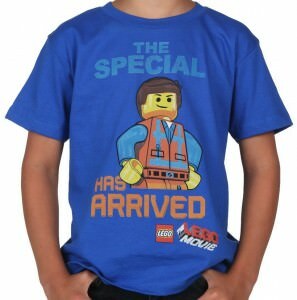 Emmet Brickowski became “The Special” unintentionally, but now your child can become just as special with this LEGO movie t-shirt. Help your little one save the universe from the tyrant Lord Business with this soft feeling 100% cotton royal blue t-shirt. Emmet is seen on this shirt in his complete orange and blue construction vest and pants just as he is in the LEGO movie, right down to his lopsided smile. This child’s t-shirt comes in sizes 4, 5/6 and 7 and has the official LEGO movie logo and “THE SPECIAL HAS ARRIVED” printed on it. It’s time to battle the feared and evil Lord Buisness, are you ready? Just simply build this Construct-o-Mech and you will be succesful. 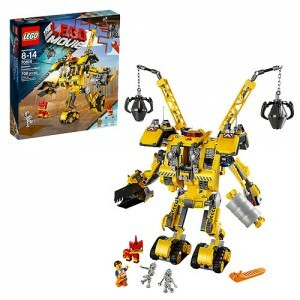 This LEGO features the Construct-o-Mech an idea that master builder Emmit had come up with in the fun and cool movie The LEGO Movie, the Construct-o-Mech consists of many different construction site machines like two swinging wrecking balls, excavator bucket, steel roller and many more. This Construct-o-Mech LEGO set has 709 pieces for you to build, it also includes one Emmet minifigure, two Skeletron figures, and one Angry Unikitty figure. Become a master builder and build your own LEGO Movie Emmet’s Construct-o-Mech.